Musk oxen look a little like a dust mop with feet. These arctic animals have thick hair that grows 2 feet long and almost touches the ground. This hair keeps musk ox warm during cold, fierce winters. Musk oxen live in Canada, Alaska, Greenland, Siberia and Norway – farther north than any other hoofed animal. Musk oxen look a little like a dust mop with feet. More all about musk oxen, these arctic animals have thick hair that grows 2 feet long and almost touches the ground. Musk oxen are herbivores. Not much grows in their cold climate, but they eat moss, roots and lichen found under the snow. In the summer, they add grass and arctic flowers to their diet. Musk oxen travel in herds of 10 to 20 oxen. In the summer, they add grass and arctic flowers to their diet. Musk oxen are big and strong. They can weigh as much as 850 pounds. They are about as tall as your dad, but a lot wider! Musk oxen live about 12 to 20 years. 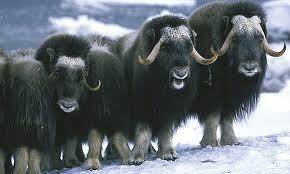 Musk oxen are hunted by arctic wolves and occasionally polar bears. Musk oxen have curving, pointed horns. When threatened, musk oxen gather in a circle with their heads facing out. Their babies are protected in the middle of the circle. They use their strong horns to keep predators away from the babies. Humans hunted musk oxen for their meat and fur. The animals were almost extinct. Now they are protected. It is against the law to hunt them. Musk oxen have two glands under their eyes that produce musk, which is a strong odor. 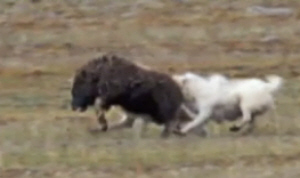 A video documentary of musk oxen fighting for territory with explanations about their collision. Question: Have musk oxen lived on the earth for long? Answer: Musk oxen were here with mastodons and mammoths. They’ve survived more than 10,000 years. 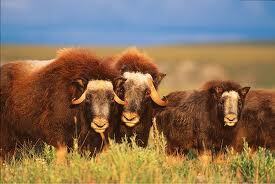 Question: Are musk oxen related to buffalo? Answer: No. Musk oxen look like buffalo, but they’re more closely related to goats and sheep. Enjoyed the Easy Science for Kids Website all about Musk Oxen info? Take the FREE & fun all about Musk Oxen quiz and download FREE Musk Oxen worksheet for kids. For lengthy info click here.